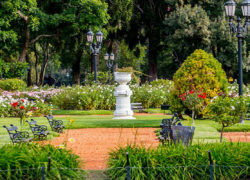 Join our Food Tour in Buenos Aires! Everyone has a different way of discovering the world. Some people will travel to see breath-taking landscapes and natural wonders; others will do it to see human-made marvels like art and architecture. But there are some others who will tell you that the thing that matters the most is…food! 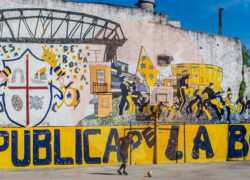 If you are among those foodies looking to get in touch with the Argentine culture through its best dishes, this post was made for you. Here is your guide so you don’t miss on any Argentinean mouth-watering specialty. Argentina is the carnivores’ paradise. There is no place in this world where you will get better meat than in here. Steak is what Argentineans are made of. Its quality and texture, the way it looks and the way we cook it; everything regarding steak in this country is just awesome! (You can see how we love bragging about it). Here steak Houses are called Parrillas, and they can be found all over the city. Check the best Parrilla in Buenos Aires! 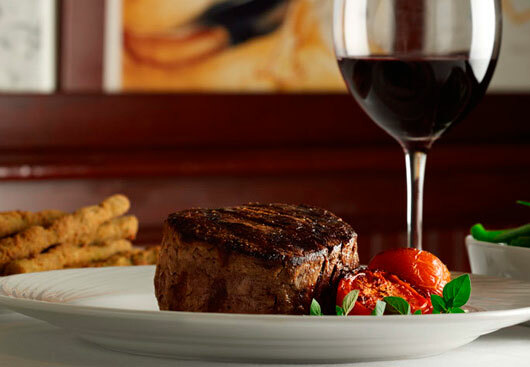 As if our steak were not wonderful enough by itself, we also have the perfect companion for it: Argentine Malbec. 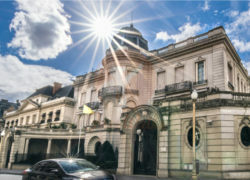 Argentine wine is among the most famous and prestigious in the world. From France to Japan, all competitions and enologists agree: the Argentine Malbec is the best of the world. 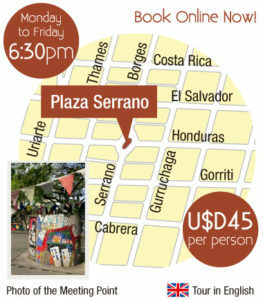 Check the best places for wine tasting! We are going to be straight forward on this one: Go get Steak and a glass of Malbec. They get along as a perfect couple dancing Tango. 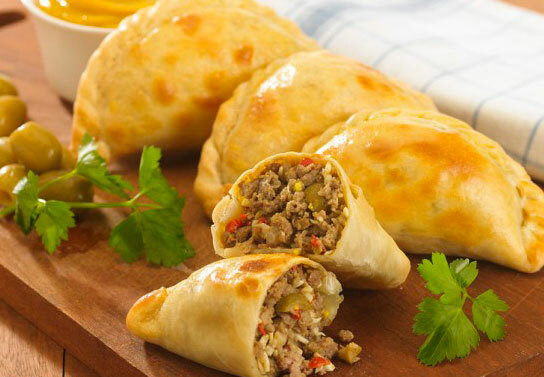 If you are looking for simplicity, then you should try Argentine Empanadas. Empanadas are stuffed bread traditionally filled with meat or ham and cheese, but the filling can be as surprising and creative as the chef decides to make it. Empanadas are easy to get.They are sold everywhere and you can eat them on the go. They can also be a good entréeat a traditional Argentine restaurant. 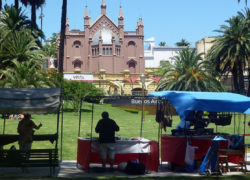 Check the best Empanadas of Buenos Aires! The Milanesa is basically a meat filletthat has been dipped in egg, coated in bread and fried.So far, this is what you may already know as a common and simple Schnitzel. But it’s in the “a la Napolitana” part where the magic truly begins. 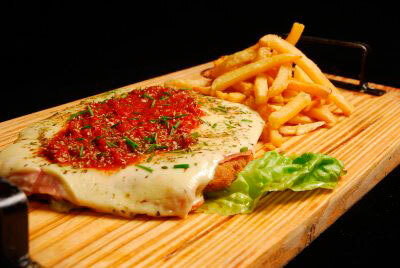 By the end of the 1940’s in a restaurant called Nápoli a man decided to add a layer of ham, grilled cheese and tomato sauce to dress up the boring milanesa, and this culinary classic was born. Nowadays, you can get it at any restaurant and it is usually the best (and the cheapest) dishof the menu. Read the full post of the Milanesas! 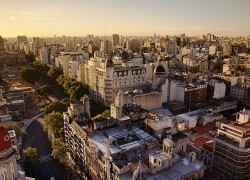 15 million people in Argentina are Italian descent. But Italian immigrants didn’t only change our demographics; they have also deeply influenced our food traditions. Argentine Pizza left behind its Italian past and evolved into something new and slightly different. Pizza in Argentina is cooked in many different ways, and it’s characterized by its thick layer of cheese and crunchy texture.What’s more, pizzas in BA are to be shared. (Full article on Argentine pizza). Another specialty we have taken from the Italians is the Gelato. Ice-cream parlors in Argentina have maintained the supreme Italian quality but added a touch of variety and creativity to the flavor. In fact, Gelaterias in BA can have between 20 and 50 flavors to choose from! 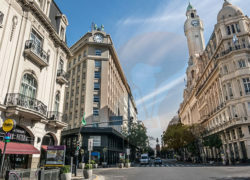 Chek the best ice cream parlors of Buenos Aires! 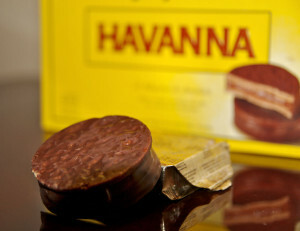 The alfajor is the classic Argentine treat to eat anywhere, anytime. It looks like a little cake made out of two crumbly cookies usually smashedtogether with dulce de leche (caramel) in the middle.They can also take any other filling. An alfajor can serve as a quick breakfast, dessert, snack or soothing balm for the broken-hearted. 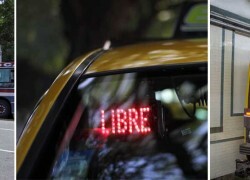 A good alfajor won’t disappoint you any time of the day and will give you that energy boost you need to walk the city! 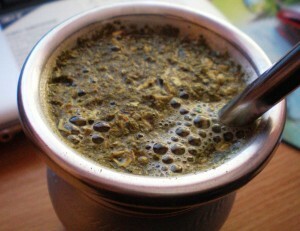 Known as the Argentine tea, mate is an infusion of Yerba Mate, a plant from the north of our country. These leaves are put in a cup and filtered through a straw, whereas tea-leaves are left inside a tiny bag. Nonetheless, the main difference between mate and tea is that mate can be shared. Disgusting as it may sound to you, mate is to be drank in groups! Yes, we all drink from the same straw, but let’s face it: you’ve had more intimate contact with complete strangers. 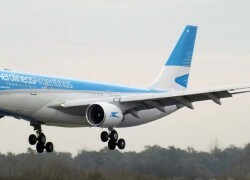 It is the Argentine social drink par excellenceand one of the most living traditions in our everyday lives. Check out full article on Mate. Hello Areej, thanks for your comment! The idea is to post practical information, we are glad you like it! have a nice trip!